Things are getting back on track here as I get back into the swing of things following my vacation to New Hampshire. It was my intent to share more about my book design work before I got sidetracked with my busy schedule! Finally, I have found time to put some things together. 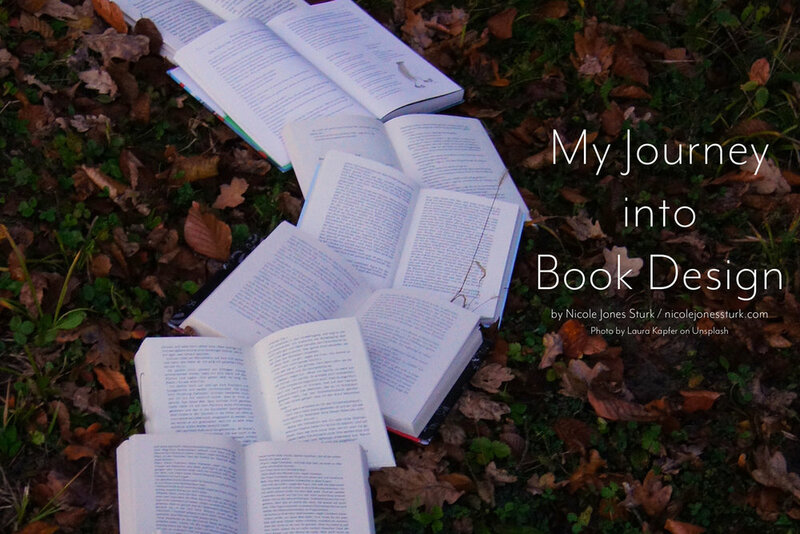 I thought I would share my story of how I came to be a book designer. I was hired to my first job as a book compositor a few months after graduating college. I had a general art degree, and little to no experience with books, so I had a lot to learn! After a short training period, my main task was to perform edits to books that had already been laid out. The company where I was employed had a variety of publishers and books they worked with, from textbooks to novels to children's books, so I got a lot of experience. As time went on, I gained more responsibilities and was assigned more complex tasks. Eventually, I was able to typeset books from scratch, starting with the author manuscript. At this point, however, I was not designing the books, but rather following templates already created by a separate designer. At first, I did a lot of work in Quark Xpress, but the work eventually transitioned to almost exclusively Adobe Indesign. Thus began my experience with that program, which is the main software I use today. This continued for many years. At first, I worked across the spectrum of publishers included in my company's clientele. As the company evolved, though, so did my role in it. In my latter years, I worked mainly with Scholastic books, which was a lot of fun for me since I have a love for the YA genre. When I left the company and began freelancing, I started offering my services not only to typeset, but also design books. Having so much experience as a compositor helped a lot. I now knew by experience the general layout of a book, how to tweak the text to create a high-level composition, how to optimize files for printing, general knowledge of typography, and just what looks good in a design. Having the technical knowledge allowed me to use my artistic intuition to guide my design decisions. I initially did some work on simple titles for self-publishers. My first big client was Atlantic Publishing, a small publisher out of Florida that I still work with today. The books I do for them, mainly in the nonfiction YA market, are a lot of fun to design. I get to have a lot of fun with typography and sidebar elements within the text. This is also when I first started working on covers, whereas my main experience up to this point was with interiors. Besides Atlantic, I now work regularly with several other companies, including some design work with my old office, as well as the occasional odd job for a self-publishing author. While I am now venturing into other areas of work, such as illustration and surface design, I think books will always be a part of what I do. My journey into book publishing wasn't planned, but I'm sure glad it found me. It has been a great ride so far, and I can't wait to see where it goes in the future. Buckle up, this is a long one, folks. I am always inspired to hear other artists' stories of how they came to do what they do. Everyone's journey is different and has lessons others can learn from. Sometimes it's good to look back and think about the important stepping stones that led you to where you are today. By doing this, you can see how far you've come, where you are now, and where you want to go. That's kind of what I'll be doing in this post. I'm hoping it will be a good exercise for me to help me come up with the next steps I need to take to continue growing my little design business. But also, I want to share a bit more about who I am with you. I don't remember a time when I didn't love to draw and make things. I was always the artsy crafty type. I had a giant drafting table in my bedroom for a number of years, and a good collection of art supplies. I used to copy characters from the VHS covers of Disney movies. I remember one drawing in particular that I did of Belle from Beauty and the Beast. I was surprised with how well it turned out (at least to my young mind) and it encouraged me to develop my drawing skills further. I sought out shows on TV about the making of movies and animation. This was before the age of YouTube and DVDs—you really had to dig deep to find that type of stuff! Books were also a great resource. Art was always a favorite class in school as well. With all of this, it might surprise you to hear that my main focus in high school was science and math. I did well in these areas (a little rusty now, though, haha) and thought that would be the sensible direction to take in my education and career. But still, art was always in the background. As a senior in high school, when I was thinking about majors, I was trying to find a way to use my science and math skills, as well as my art skills. In my mind, I thought one field might be a perfect solution: architecture. When I look back on it now, it seems odd that I decided to enter college as an architecture major. It wasn't something I'd been particularly interested in before, but the idea of being able to make a living designing things was appealing. My first semester went ok. I had a couple architecture classes to start out with—one about drafting plans, which was kind of fun, and the other about building codes (boooring). All in all it was just...ok. Second semester came, and I took a Drawing 101 class. Even though it was an art class, it was required for architecture students. I was smitten. I'd found my place. That semester, I dropped architecture and became an art major, and never looked back. It helped that my sister, Dani, was also an art major and I could go through my schooling with her by my side. (Sidenote: I attended the same college at the same time as my two triplet sisters.) To their credit, my parents never criticized my decisions. From the very beginning, they were always encouraging of whatever I or my sisters wanted to do. I'm sure they had their worries, but they were supportive nonetheless. Only now as I look back do I fully appreciate how that helped me get to where I am today, even if it meant I had to do a lot more meandering to get there, as you will see. While my sister Dani focused on illustration (She works as a children's illustrator today), I stuck with the general art degree. I knew I wanted to work as an artist, but I didn't know how. Did I want to sell art in galleries? Did I want to do graphic design? Children's books? I just didn't know. And that's where I ended up by the time I graduated. For some months after college, I went through an uncertain phase that I think a lot of graduates experience— trying to find work but not wanting to settle for a boring office or retail job (because then what did I do all that work in school for?) but also needing to move out of your parents' and earn a living. It was hard for me to get out of my comfort zone, so I stayed close to home, which greatly limited my job prospects, especially for an art school graduate. I made a few weak attempts at sending out my portfolio and creating a few greeting cards (probably none of which I actually sold). Enter book publishing. If you browse the classifieds for jobs, you'll find a lot of positions in service, medical, and labor—not exactly what I was looking for. But one day, I found a post seeking a typesetter for a nearby company that worked for major book publishers. No, I didn't have any experience, and it wasn't exactly "art" per se. But it was somewhat design-related, and certainly something I was willing to learn. I applied, interviewed, and was (thankfully) hired. Fast forward 10 years. I eventually became a top typesetter in the small company, and then, eventually, the only in-house typesetter as the company went through several mergers and a bit of downsizing, and then switched to outsourcing the majority of production work. I learned a lot at this job. I became knowledgeable in book publishing procedures; familiarized myself with industry software (especially Adobe Indesign); and learned how to communicate with clients and work with fellow employees. Design-wise, I developed my skills in typography and book design. These years were invaluable to me. As I settled into day-to-day life at my office job, the goal in the back of my mind was always to eventually work for myself from home doing something creative, even if I wasn't quite sure exactly WHAT I wanted to do just yet. I found ways to stay involved in creative things. I tried my hand at blogging with an arts and craft site called Niki Jin Crafts. Today, I still continue with it (now at Make Happy Things), but have yet to dedicate enough time and energy to make a living at it. Once in a while, I found time to draw and make art. Working on my portfolio was always on my to-do list, but I rarely accomplished anything. An important step in my journey was when I discovered the world of surface pattern. I found a book about pattern design—a rather dry and academic book to read, yet it sparked something in me. I found it fascinating. I went online and found other artists and whole communities of surface pattern enthusiasts. This was a turning point in realizing the type of artist I was. I realized how much I loved decoration, flourishes, and repeats. And flowers—all the flowers! I've also since discovered a love for typography and hand lettering, which I attribute partially to my work with books. So now, after many years of wandering aimlessly, so to speak, I had a better idea of what I wanted to do. So you'd think that once I knew what I wanted to do that I would take action, right? Nope. I mean, yes, I did start taking workshops and learning from online classes, and I added some patterns and lettering to my body of work, but I stayed comfortably settled at my day job. Like I mentioned before, I'm not one to wander out of my comfort zone often. That, and I'm super great at procrastination. Then, BAM!, all the changes started happening at once. Within just a few years, I fell in love, got married, and had a child. Then, to top it all off, I got pregnant again AND moved across the country so my husband could attend school. Having to leave my job, now I was basically forced to figure out a new direction in my career. There was a lot of pressure to succeed because I was the majority of my family's financial support since my husband was a student. Since there were also two babies to take care of, I decided to try freelancing so I could stay home with them. So after years of wandering, floundering, and procrastinating, I FINALLY took the first definitive steps towards my end goal of working as a creative freelancer! Leading up to my move and my departure from my office job, I started looking at the freelancing site Upwork for small side jobs to get the ball rolling. I applied for both jobs I knew I had the skills and experience for (i.e., book design), as well as the types of jobs I wanted to do, like illustration. The first months working full-time from home were a little slow. But I did get a job. Then another. Eventually, I had a few good clients to keep me busy with regular work. Yay, me! I have only been freelancing full-time for about a year and half now. I would say the majority of the work I do is still book design and typesetting (which, don't get me wrong, I still rather enjoy), but illustration and design work is becoming more and more frequent, which is exciting for me! With the occasional creative design job and my own personal projects I feel like I am in a great artistic phase in my life right now, which I hope only continues for a long time to come. To be honest, I am very blessed to be where I am right now. If you'd asked me a few years ago where I wanted to end up, I would've said that I wanted to work for myself from home doing something I love. And look at me now. I work from home designing books, drawing pictures, and taking care of two beautiful little girls. I've made it. As happy as I am now, there's always room to grow, especially since I'm only really just getting started. I would love for the illustration and design work to continue to develop. Perhaps it would be nice to eventually create and successfully sell my own products, rather than working solely for clients. There's always the matter of money as well. It always comes down to the bills, doesn't it? (Sigh) While I make enough to get by, let's just say I'm no millionaire. But I'm not talking about wanting a life of luxury. Rather, I think having some financial stability gives peace of mind, which allows for more freedom to pursue creative goals. I think that's a holy grail goal that many artists strive for. Also, I have a husband aiming towards medical school, so... hello, student debt. If I were to give advice to an artist or designer looking to freelance, I would say, in the words of Nike, JUST DO IT. Do what you have to do. I mean, yeah, be wise about it—save a little money, develop a good portfolio, do your research, and make sure you know your stuff. The thing is, I had everything I needed for years, I just didn't act. I think both fear and comfort contributed to my delay—fear, because I was afraid of failing, and comfort because my long-time job with all its benefits and steady pay was hard to leave. But once I got started, it honestly took me less time than I thought it would to gain traction—and that's even with having my second baby in the midst of it all. There's no secret to success. If you do the work, the results will come. It's just taking it one step at a time. That's not to say there isn't the possibility for failure, of course, but you'll never know if you don't try! This year I want to really focus on the type of work I want to be doing for the rest of my life—the work you see here on this website. Since I started working on my own, I've really put a lot of effort in building up a body of work that I can be proud of, and that I'm passionate about. In 2017, there was a lot of progressing, learning new things, and exploring different outlets to express my creativity. This year will be no different. With this, I've been reevaluating what I've been doing, where I stand now, and where I want to go. As always, it helps to write things down. Hello, and welcome to my website. I hope you enjoy browsing my portfolios. I put my heart and soul into my work. It is my passion! I am a mother, wife, designer, blogger, and artist. Since I started freelancing, I have been living the dream of staying home to take care of my family, while also doing the work that I love! I also have over ten years of experience in book design and typesetting. I formerly worked as an in-house book compositor at Jouve North America (formerly NK Graphics) doing page layout for both trade and text books. In that time, I had the opportunity to work on projects from a variety of publishers, including Scholastic, Penguin, and Bedford/St. Martin's. I especially love to work on children's and YA books. Since I've started freelancing, I've also been able to help others on more personal projects, such as photo and picture books for gifts and works for self-publishing.